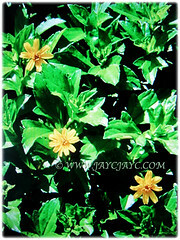 Singapore Daisy or Trailing Daisy is very attractive because of its nearly constant and prolific blooming of yellow daisy-like flowers. Besides, it has been used for traditional medicine. Sphagneticola trilobata is listed in the IUCN’s list of the world’s 100 worst invasive species. Botanical Name: Sphagneticola trilobata (syn. : Wedelia trilobata, Wedelia carnosa). 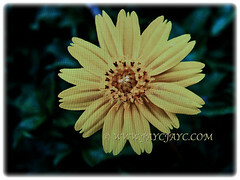 Common Names: Singapore Daisy, Creeping-oxeye, Trailing Daisy, Wedelia, Yellow Creeping Daisy, Rabbit’s Paw. Etymology: The genus name, Sphagneticola means Sphagnum dweller, a possible reference to the plant being able to survive in waterlogged or flooded sites. The specific epithet trilobata describes the 3-lobed leaves. Origin: Native to Mexico, Central America and the Caribbean. Plant type: A herbaceous and perennial shrub. Features: Sphagneticola trilobata is from the genus, Sphagneticola that comprises of 84 accepted species. It is a fast-growing, herbaceous creeping perennial shrub that grows up to 30 cm tall and forms dense mounded mats over ground. It has rounded stems up to 40 cm long, rooting at nodes and stolons up to 2 m in length or more. The opposite arranged leaves are fleshy, glossy and hairy, 4-9 cm long and 2-5 cm wide, serrate or irregularly toothed, normally with pairs of lateral lobes. They are dark green above and lighter green below. 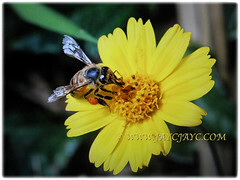 The bisexual flowers are bright yellow ray florets of about 8-13 per head, rays are 6-15 mm long with disk-corollas 4-5 mm long. Its daisy-like blooms are borne singly on the end of each stem. The central disc florets are yellow and tubular. 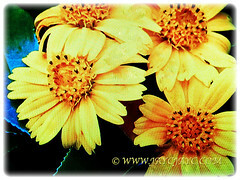 Flowers freely and are produced throughout the year. The pappus is a crown of short fimbriate scales. Its seeds are tuberculate achenes, 4-5 mm long with a brown, dry and hard fruit cover. 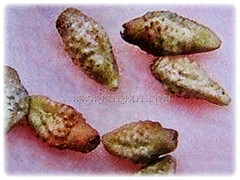 Its simple and indehiscent dry fruit, 3-cornered nuts are very small, 3-5 mm with corky covering and topped by short scales. The inconspicuous fruits mature from green to brown and are dispersed by water. Plant seldom sets fertile seed under local conditions. 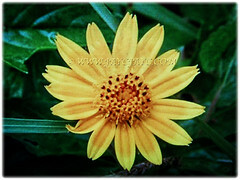 Culture (Care): Sphagneticola trilobata or Singapore Daisy grows easily with the least maintenance. Light: Prefers full sun but also performs well in semi-shade. Soil: Very adaptable to wide range of soil types, including nutrient-poor sand, saline soils, swampy or waterlogged areas. Others: All plant parts contain ivalin, toxic to mammals when ingested and known to result in aborted fetuses in farm animals. 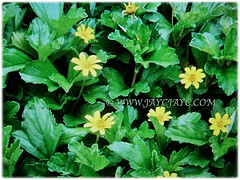 Fast growth may smother nearby groundcovers, thus plant should be pruned back regularly. Generally free from serious garden pests and diseases. However, do watch out for chewing insects, leaf hoppers and mites. 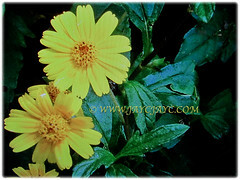 Sphagneticola trilobata or Singapore Daisy, though killed to the ground by frost when grown in temperate countries, it makes a fast comeback with the onset of warm weather in the spring. It tolerates high heat and seaside conditions. Leaves are green in colour and do not change colour during autumn in the USA. It produces the most flowers in open, frost-free locations. In non-hardy regions, plant this beauty in a large container to easily overwinter indoors. Propagation: Easily propagated from seeds and vegetatively propagated from herbaceous stem cuttings and stolons. 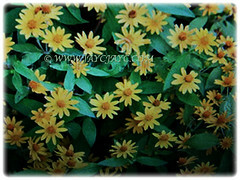 Usage: Sphagneticola trilobata or Singapore Daisy is widely cultivated as an ornamental groundcover. It is especially good for soil retention and erosion control. It has medicinal properties. Paste of mashed leaves applied to joints to relieve arthritis and rheumatic symptoms. Crushed leaves used as poultice or drunk as tea to treat colds, flu, fever and inflammation. Should not be consumed by pregnant women due to possibilty of miscarriage. Excellent for flowerbed and border and ideal to be grown on the ground or in containers. An ideal butterfly food plant too.